Yesterday, the news that Provo is the best place in America for business and careers made headlines. Then, earlier today I wrote about the benefits of buying local. Relatedly, Utah Valley Business Q recently released its rankings for the “Top 10 Startups to Watch,” and several Provo companies not only made the cut but are the most exciting entries on the list. For me, I work every day to make a difference — to make eating in Utah better. That is something I can feel good about when my head hits the pillow at night. Other Provo companies that show up on the list include the tech support business PcCareSupport and EcoScraps, which converts excess food into compost. Taken together, these enterprises show why Provo not only has a great business community, but also is a tech hub with a strong restaurant scene. Utah Valley Business Q ranked Communal as one of the top startups to watch in 2012. The first time it occurred to me to “buy local,” I was in a popular Italian chain restaurant and realized my food was terrible. Even the worst local restaurant, I suddenly realized, would be equally tasty and certainly more unique. For a long time, that was the logic that drove me to local restaurants. 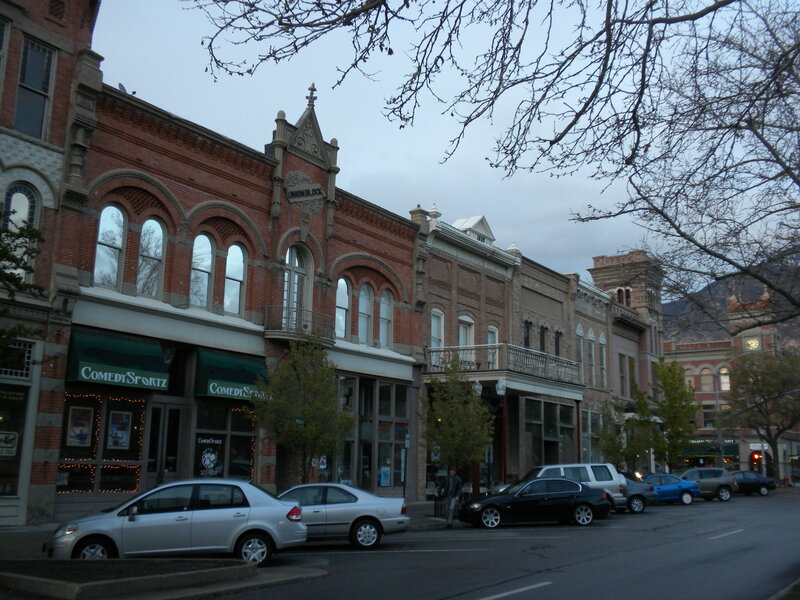 And to this day, I think that’s a fine reason to eat and shop at locally owned businesses; though there are certainly some local duds — in Provo or anywhere else — local companies offer unique experiences by their very nature. But as it turns out, the reasons to buy local aren’t just limited to the potential for a better consumer experience. Indeed, one of the best reasons to buy from locally-owned and operated businesses is because doing so supports the local economy. 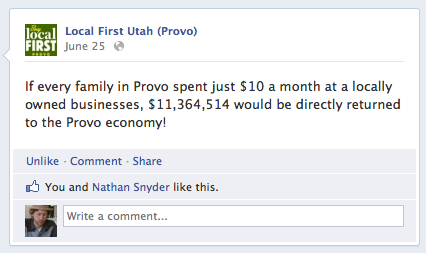 So, for example, let’s say you want to eat out at an Italian restaurant and you’re in Provo. You can choose the Olive Garden or another chain, or you can choose La Dolce Vita or another local business. Setting aside the food itself — which we could quibble over endlessly — choosing to dine at La Dolce Vita puts more money into the local economy because the business operators presumably are a part of the community. The profit made by that restaurant ends up being reinvested in the business itself or goes into the pocket of the people who live down the street. In turn, those people spend their money in the community and the cycle repeats. In any case, that’s a simplistic but nonetheless effective way to understand the concept of buying local. And in fact, the difference between buying local and “buying corporate” is pretty dramatic, according to LocalFirst.com. Drawing on a 2008 survey on Grand Rapids, the website points out that for every $100 spent at a local business, only $32 leaves the community for things like supplies. By contrast, for every $100 spent at a non-local business, $57 left the community. All these benefits may be captured for the people of Kent County with a small change in habits. Just one time out of ten, before heading to a chain store or restaurant, take that business to a local. We believe quality, service, and value for the dollar will be their own reward, but that small act will strengthen the local economy and build a better, more sustainable Greater Grand Rapids. The survey mentions that Grand Rapids is representative of the larger U.S., but closer to home Local First Utah offers 10 more reasons to actually make the shift to buying local. The list includes economic benefits, but also points out that buying local is more environmentally conscientious, fosters diversity and community, and can help transform a mere location into a desirable destination. Ultimately, the benefits of buying local are immense and range from the visceral — like my initial reaction at the Italian restaurant years ago — to the economic. Over the next few weeks I plan to periodically mention a few local businesses that I particularly appreciate, but in the meantime, it’s worth remembering that every dollar spent at a local business is a dollar spent building the community. 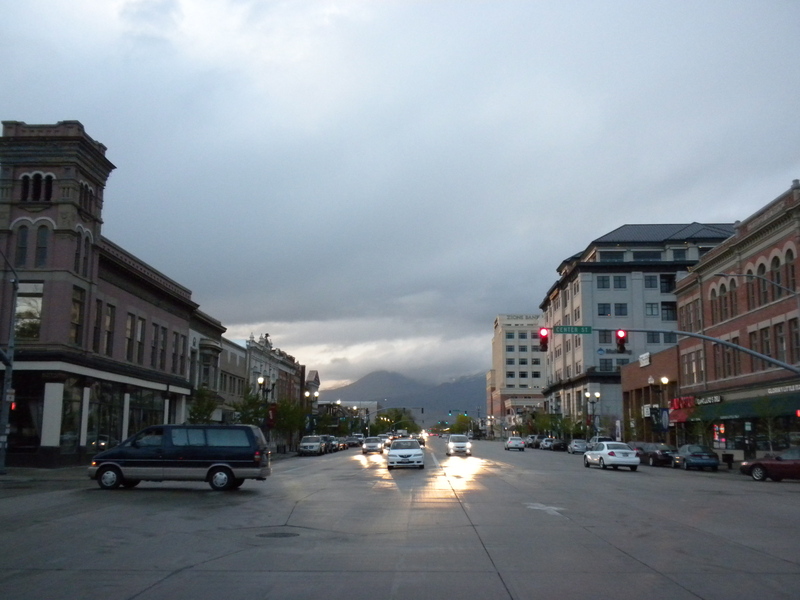 A row of local restaurants, entertainment venues and shops in downtown Provo. In 2002, building a parking spot cost $22,500. That’s perhaps the most startling piece of information from this post over at Market Urbanism. The post is a partial review of The High Cost of Free Parking, and serves as a follow up to the piece I highlighted last week. In the post, Emily Washington explains that author Donald Shoup arrived at that figure by looking at parking structures built between 1961 and 2002 on the campus of UCLA. Of course, the cost of parking would vary by location, though I’ve heard other, much higher construction costs for parking in cheaper cities. Shoup explains that parking requirements breed demand for more parking. By subsidizing driving, these rules lead more people to become drivers and encourages sprawling development. This in turn creates an increased demand for free parking and leads to higher parking requirements, since many cities base these requirements on the peak number of people who would like to park at a building for free, leading to the parking disaster we have today. The post includes a lot of other interesting information, as well as a critique of Shoup’s argument, but I think the relevant point here is that parking is a consumer good — like milk or cable TV or cars themselves — that cities and residents demand at below-market values. What happens, however, is that the cost of parking gets rolled into other things that people pay for. And as I mentioned in that post linked to above, people wouldn’t tolerate this sort of behavior for anything else. No one thinks the city should require grocery stores to give away milk to everyone, for example, so it makes equally little sense for communities to treat parking that same way. That’s a hard reality to accept when we’re so used to “free parking,” but it still is a reality we need to accept if we’re going to better use our city space and create healthier communities. Free parking at a mall in Orem. As it turns out, Provo isn’t just the best place for business and careers in America, it’s also a leading technology hub. Richard Florida and The Atlantic Cities reported today that Provo is the 13th best metro area for technology in the United States. That puts Provo in the company of places like Seattle, Silicon Valley, San Francisco, etc. One of the interesting things about this list is the presence of both tech hubs and, for lack of a better term, hipster meccas like Austin and Portland. Though things like a vibrant cultural scene and business leadership might superficially seem disconnected or targeted at different demographics, this list suggests that they are in fact quite connected. In fact, this information indicates that successful cities are ones that understand the holistic nature of growth, culture, and economics. Technology is the first of my 3Ts of economic development, the other two being Talent and Tolerance. Each one on its own is a necessary but insufficient condition for growth. For real innovation and sustained economic growth, a community must offer all three. That means that some cities and metros may still fail to grow at a high rate, despite their deep reservoirs of technology and world-class universities, if they lag behind on the other two T’s – if they are exporting talent or are relatively closed to outsiders. Conversely, the interactive effect of the 3T’s helps explain why some cities and metros may fail to grow at a substantial rate, even though they are lifestyle meccas: they lack the required technology base. That assessment suggests a clear path to sustaining Provo’s success: increasing tolerance and retaining more talent. Provo wouldn’t be on the list at all if it hadn’t made headway in these areas, but if the city is going to continue to grow, all three will have to increase. Did you know that otters are native to the Provo River? I didn’t until I watched the video below on BYU’s efforts to bring the otter back. This project is great for a lot of reasons, the biggest probably being that there is inherent value in wise environmental stewardship. But the project is also fascinating because it highlights the value Provo gets out of having both a major university as well as a rugged natural landscape. Whereas many cities have colleges or environmental assets, this video shows how in Provo those two elements are now working together. The fact that a restored river system and more wildlife will also make the area more popular for recreation also shows how both the school and the river benefit the economy. The $16 billion economy is thriving largely on the back of Brigham Young University. The school provides a stabilizing presence as the third-largest private college by enrollment in the U.S. The school is also generating new jobs. During 2010 it ranked third in the numbers of start-ups produced through university research—13 in total—behind only the nearby University of Utah(18) and MIT (17). Job growth was a robust 3% in the Provo metro in 2011, third best in the U.S. It enjoys—by far—the lowest violent crime rate in the U.S. and ranks tenth lowest overall for crime, including property crime. The metro population has doubled over the past two decades to 542,700. It’s significant that Provo topped the list both because there are many other cities that covet that spot, and because the article describes the larger economy as continuing to “sputter along.” Also worth mentioning is the fact that Provo specifically beat other metro areas in states like Texas and California with larger populations and bigger boom industries like oil, shipping, tourism, education, etc. The article also uses nice a photo (not the one below in this post) of the intersection of Center and University that captures the increasingly cosmopolitan character of the city. Provo is the very best place in America for business and careers. Way back in January, I wrote about “pocket neighborhoods,” which basically are little clusters of homes squeezed into the underused nooks and crannies of housing developments. The idea is to better use space, make more walkable communities, strengthen community bonds, etc. Essentially, pocket neighborhoods are small groups of houses or apartments gathered around a shared open space. They might take the form of a garden courtyard, a pedestrian street, a series of joined backyards, or a reclaimed alley. These clusters form at a sub-block scale in a semi-private zone of ownership. Think of them as a neighborhood within a neighborhood. The key idea is that a relatively small number of nearby neighbors share and care for a common space together. At its core, this is not about aesthetics or style; it’s about design that cultivates healthy neighborly connections. If that’s hard to visualize in the real world, just click over to the article to see a whole bunch of pictures of the idea in action. The article then goes on to lay out some fundamental features and what they’re designed to do. Pocket neighborhoods, for example, aim to bring neighbors into greater connection with each other via a gradient of public-private spaces. In other words, it’s not all about simply having private space inside the home or backyard and public space outside. Having a next-door house or apartment peering into your own can be uncomfortable and claustrophobic. Therefore, design residences with an open side and a closed side so that neighboring homes ‘nest’ together — with no window peering into a neighbor’s living space. The south side of this cottage below opens to its side yard, while the north side of the next house has skylights for daylight, but no windows looking back. As I mentioned in my first post on pocket neighborhoods, this concept shows a lot of promise for a place like Provo that already has walkable central communities as well as acres upon acres of wasted space. There are certainly other ways to better utilize that space, but pocket neighborhoods would be a concession to a culture that continues to celebrate the detached, single family home. Pocket neighborhoods also offer a much-needed way to increase residential density without building skyscrapers.